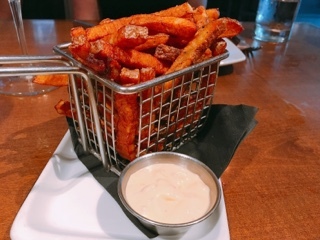 If you’re trying to satisfy a picky eater or a crowd with varying tastes, Azarias is a good choice for an Etobicoke restaurant. Although the establishment sounds Greek (on account of being named after the owner), their menu has a diverse array of dishes to choose from. Most are shared plates, but if you’re over the trend, you can easily pick and choose salads and larger plates to create a traditional meal as well. Stumped on what to order? Azarias provides a top ten list to guide you through the process. The first half of this post will focus on these popular dishes. 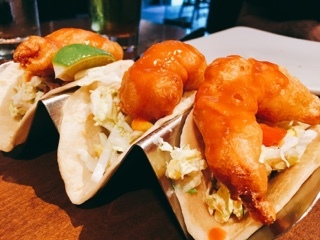 Topping the list is the spicy shrimp tacos ($15), a let-down unless you enjoy overly battered seafood that hasn’t been drained properly. 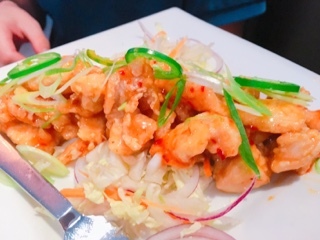 The only saving grace was the shrimp’s large size, lending itself to stay plump and juicy. But then it’s laden with oil and a “spicy” sauce that’s surely just Frank’s Red Hot out of the bottle. Plain cabbage with a bit of corn lines the bottom of the flour tortilla, hardly the salsa fresca you’d expect as described on the menu. 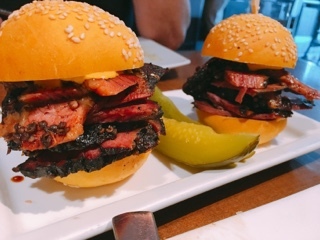 Go with the #2 option instead: Montreal smoked meat sliders ($10). Overlooking the dense bun, the thickly sliced meat was tender incorporating enough fat for taste without getting heavy. Served warm, you get a bit of spice with each bite and despite being full flavoured, the smoked meat wasn’t too salty and went well with the mustard. Paired with a juicy pickle wedge, it’s a dish that could make a Jewish deli proud. 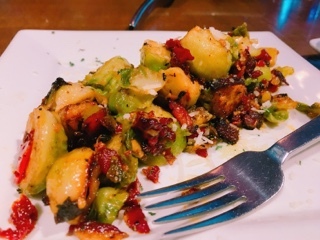 When Brussels sprouts ($9) are done right, they are so good. Azarias’ version is fine but runs into the pitfall of relying too heavily on other ingredients – in their case, sun dried tomatoes and bacon. Since both are such strong flavours, the actual sprouts get drowned out. If I want bacon, I’d order bacon. For a vegetable, I want Brussels sprouts! Their Kung Pao chicken ($14) was a popular dish that many tables order. The sauce has a wonderful spicy kick, a sweet chili Thai enhanced with garlic sauce, so it’s a shame that the miniscule chicken pieces were so overly battered. Personally, I’d prefer the chicken to be simply tossed in flour (rather than a full-on batter) and cut into larger pieces so that you can actually taste the meat. The jalapenos, on the other hand, were a nice touch. 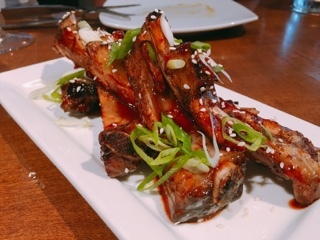 Surprisingly, their short ribs ($18) were only #7 on the top 10 list. It was certainly one of the better dishes I tried that evening and deserves a top three ranking. 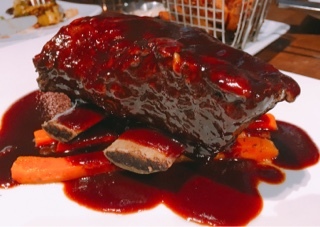 The large bone-in rib is braised until tender and glazed in a wonderful reduced beef jus. With the roasted carrots, this could easily be a main dish for those who don’t feel like sharing. Bacon seared jumbo scallops ($15) was the last top 10 dish we tried. 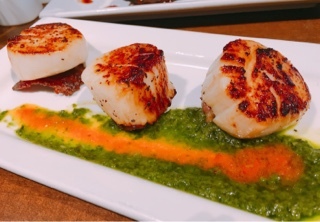 With a lovely caramelized crust and their large size, the scallops remained tender and meaty. Instead of being wrapped in bacon, it was nice that the meat was on the bottom so you can break chunks off with the scallop or have it as a crispy meaty chip to end. In terms of the dishes that didn’t make the list, there were some hit and misses. 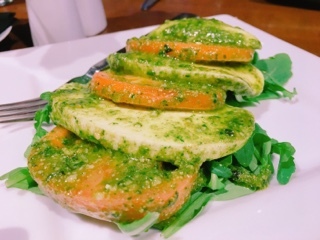 The Caprese salad ($11) was heavily slathered with pesto but needed more salt. Interestingly, the kitchen tosses the cheese and tomato slices in the sauce (rather than pouring over top), which is a good idea allowing every bite to get an even coating of flavour. 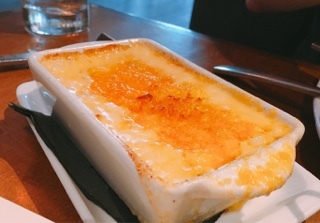 Although the macaroni and cheese ($9) looked watery, the flavours were spot on and the light dusting of buttery gratin on top was fantastic. Pair these with the short ribs and you can easily build a decadent plate. 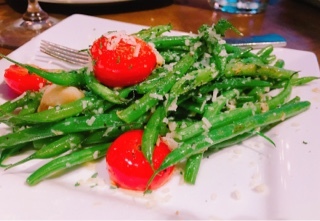 The green beans ($8) were fantastic and much better than the Brussels sprouts. Since they were cooked on a grill, they retained a great crunch and the roasted garlic and dusting of parmesan added enough flavours without taking away from the actual vegetables. For the low price, you get a hefty portion of potatoes with the sea salted fries ($5). They are piping hot and have the essential freshly cut potato essence. Combine the fries with the Montreal smoked meat sliders and you have a great meal. Despite already having an extensive menu, Azarias also offers daily specials. Having tried two of the dishes, they’re definitely worth ordering. 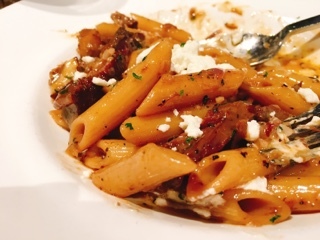 The osso bucco with penne ($18) could easily be a pasta main dish given its large size, but since the garlicky cream sauce is pretty rich, it also ideal for sharing. Dollops of goat cheese combine with plump mushrooms and chunks of soft lamb to make a great meal, I would have been happy with just a plate of this to myself. 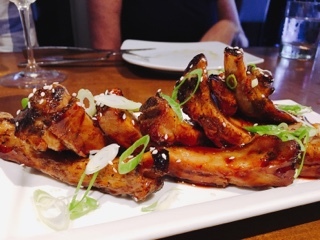 They baby back pork ribs ($14) where glazed in honey garlic and very tender and meaty. They’re sticky and messy, everything you want ribs to be. Azarias resourcefully uses pots of herbs as décor on tables, while also including a pair of scissors so diners can actually use the herbs. Our waiter suggested we cut up the basil to infuse the olive oil for dipping bread into. What a delicious idea that enticed me to devour two slices of soft crusty bread – much to the demise of stomach for the rest of dinner. Let that be a warning when you visit… just one slice.